Stainless Steel SPB SSGEG.C Series have an inner ring with a sphered convex outside diameter and an outer ring with a correspondingly sphered but concave inside surface. It is suitable for high shock loads and medium to heavy industrial/mechanical load applications requiring low friction. They do not require maintenance. Some of these bearings will look like the out raceways are cracked or split, however this is a normal part of the manufacturing process and is a viable bearing still. 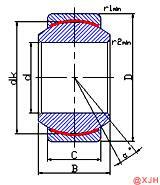 Its design makes them particularly suitable for bearing arrangements where alignment movements between shaft and housing have to be accommodated, or where oscillating movements or recurrent tilting movements must be made at relatively slow sliding speeds. Enriched by our vast industrial experience in this business, we are involved in offering an enormous quality range of Stainless Steel SPB SSGEG.C Series. Our clients can avail this from us at the most reasonable price. Welcome to send us the inquiry, and we will get back to you immediately. As the same as series GEG…C, but in stainless steel.